Size: 5.0" x 2.8" x 0.4"
This Canon F-700 is one of the typical "Do it all" calculators introduced in the 1990's. 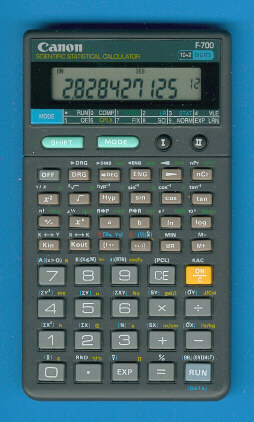 Searching the manufacturer of this typical OEM-calculator is easy, the printed circuit board (PCB) gives the designation Truly 105C. Mike Sebastian's "Calculator forensics" reveals with the uncommon result of 9.0000389918 the NEC uPD75308 as calculator brain, actually a common 4-bit microcomputer with integrated display drivers and enough RAM to implement a small programmable calculator. The successor of the F-700 sports a two-line display, don't miss the F-720. © Joerg Woerner, June 22, 2003. No reprints without written permission.